At Chiltern Skin Clinic (working from Amersham Hospital, Chiltern Hospital and Shelburne Hospital) you will meet a team of professionals dedicated to delivering the best possible care with cutting edge technology. From the moment you arrive, until you are fully recovered, an exceptional team of patient co-ordinators, nurses, assistants and technicians are dedicated to make your experience outstanding. We are the leaders in Skin Cancer Screening, diagnosis and treatment. 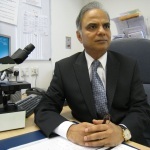 Dr Mohsin Ali, the surgical dermatology lead for skin cancer treatments, is the founder of MOHs micrographic surgery services for advanced critically sited skin cancers in Buckinghamshire. We provide state of the art (Gold Standard) MOHs micrographic surgery. We specialise in scar management, mole mapping, complex tumour treatments and all kinds of lumps and bumps surgery of the skin especially the face. We provide comprehensive general dermatology services including full skin examinations, management of acne, eczema, psoriasis and other rashes. CHILTERN SKIN CLINIC is a Skin Care & Dermatology Centre and Dr MOHSIN ALI and his staff are dedicated to ensuring your safety and satisfaction. The mission of our practice is to provide the highest level of clinical expertise, latest technological advancement in management of skin disease in a warm and welcoming patient friendly environment, closer to home. We are committed to educating our patients about their skin, promoting sun safety and providing lifetime skin care for prevention of skin cancer and skin disease.